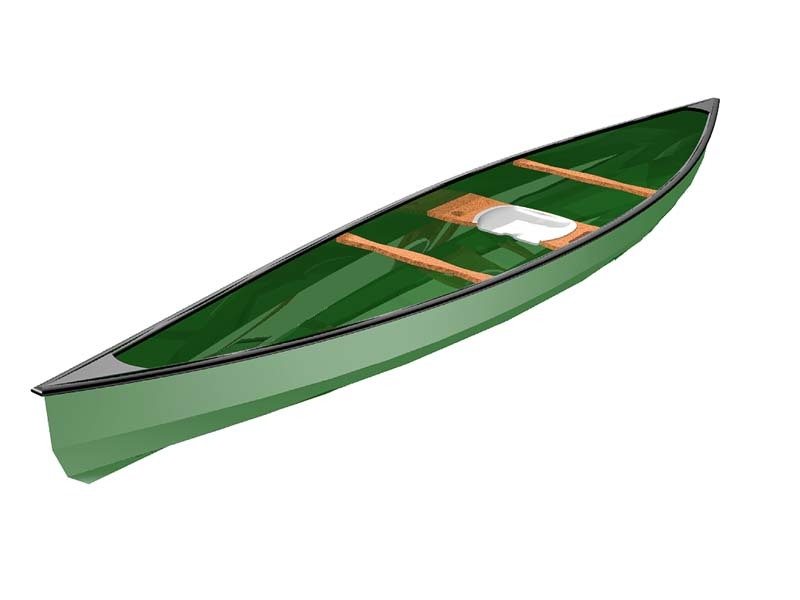 Right up front, I’m going to give a full tip o’ the cap to John Winters, Canadian boat designer, for the inspiration to design this particular canoe. John’s Osprey II S&G design is a beautiful example of a designer bringing his enormous, gifted skills to the worktable. I wanted to draw a solo, tripping style canoe for 4mm marine plywood construction, so I took a long look at the Osprey to see if there was anything I could do differently with the form. 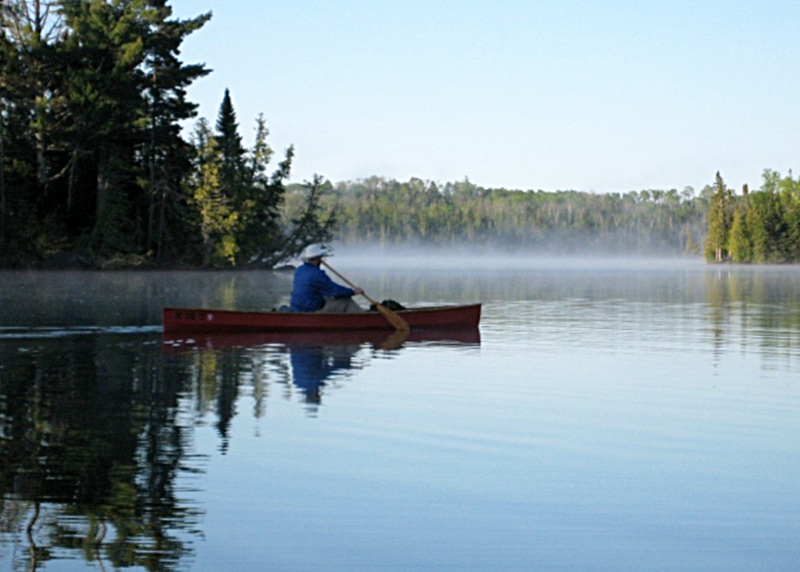 Note: At the end of this article, there is a report from a builder and the results of a committed journey with the Big Horn in the Boundary Waters Canoe Area. Please continue reading to discover a first-hand report as to how the boat behaves in the real world. From a designer’s perspective, it is incredibly satisfying to have independent verification of all the hours that go into the design of a boat like this one. 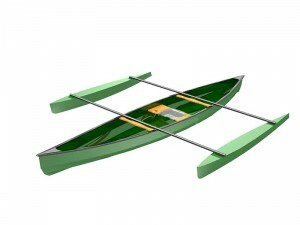 In Winters’ design, there is a very nice, tumblehome chine along the shear to give additional paddle stroke clearance. I have built boats before that used a similar tumblehome panel and it turns out that they can give the builder some interesting problems when it comes to constructing the hull. 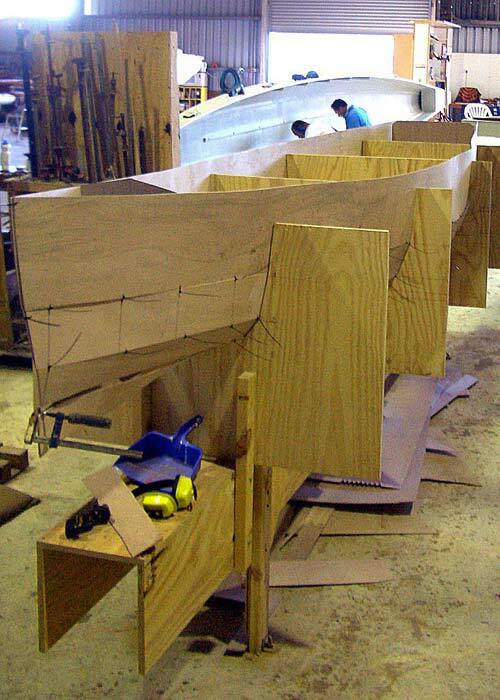 This tumblehome chine is very slender in width, which requires the builder to have a reasonable set of skills to wire it in place prior to filleting or they will end-up with a potentially wavy hull section that just won’t go away short of doing it over. Since I was looking to draw the Bighorn for easier construction for the average guy, I decided to drop the tumblehome panel and instead raise the outer hull panel to maintain freeboard. The result is a six panel hull that is easy to build and nice looking. The hull shape is asymmetric in form with the widest point (and it’s center of buoyancy) just aft of the hulls’ midpoint. The hull also has decidedly enhanced rocker fore and aft when compared to traditional canoes of this size. These two design features give the boat very solid, straight-line tracking, as well as wonderful response to turning stroke input from the paddler. At full, 350-lb. displacement load, the Bighorn has just less than 8” of freeboard amidships. I don’t see this kind of load in this boat unless the owner is going out for a very long solo trip and needs to carry a lot of gear. More likely, you’ll be seeing an all-up, ready for trouble, load of around 290-300 pounds, depending on the weight of the paddler. I figure this boat can be built at right around 42 pounds, providing the guy with the resin doesn’t get too generous with the glue. If you don’t care for the integrated seating system, you can always use the traditional, woven caned seat, a simple, stretched canvas platform or a woven-webbing seat. For that matter, you could always buy a tractor seat from Wenonah. Outside the typical description of a solo canoe introduction, I decided to include a little extra teaser for those so inclined. I drew a set of outriggers specifically for this boat. They aren’t fancy in appearance, but they are very simple to build, easy to use and they provide enormous stability to the boat if you’d like to fish, shoot pictures, take a nap, shoot birds, etc. If you were so inclined, they can also be used with a modest sail rig to allow the Bighorn to be sailed like a trimaran, though don’t be expecting these amas, or the suggested sail rig size of 30 sq. ft., to provide much more than a pleasant sailing experience. Still, it could be fun on the right body of water. The complete web record of the Heres build is currently not available. I’ll search for it and locate what I can of the document. “I purchased plans from you for the Big horn a few years ago. 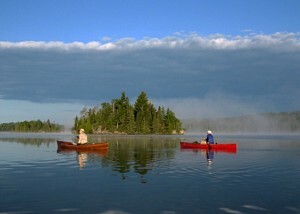 My son and I built the canoe and have since been on 2 Boundary Waters trips with it. I promised you that I would detail the building process. I did and am just finishing the presentation up and will post it soon. Lightest(34 lbs), receives the most comments by a wide margin (it looks really good), slowest of the 3 and hardest to keep in a straight line of the 3 at speed. 2nd lightest lightest(36 lbs), very functional but does not get the comments, 2nd fastest and stays in a good straight line. Heaviest(38 lbs), glides like a dream, Kevin, who uses it, will effortlessly pull away from the other canoes, tracks straight as an arrow. It’s pretty clear that I am proud of the boat and how it has turned-out for an experienced canoe builder. Being able to say that one of my boats can effortlessly pull away from a design created by a known master in the trade is exciting. That it also has terrific tracking manners when loaded and out on serious water, really makes all the design considerations worthwhile. Stan, thanks so much for the really kind words on the boat. I’m really looking forward to Kevin’s report. 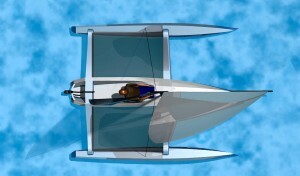 I have developed a new, personal trimaran for small adults and kids called the Solo12. This is a car toppable boat that is meant to sail with no facility for human power other than hauling out the spare canoe paddle and getting with it. The total displacement is 300 lbs. all-up and should tip the scales at about 130 lbs. before getting wet. So, there’s room to wiggle for a wiry dude who wants to tool around in quiet waters and have a blast in a semi-reclining position. Steering is via a pair of pedals and cables to the rudder cheek block, much like a kayak and all the sail controls are fed forward so there’s no need to hike out at all. 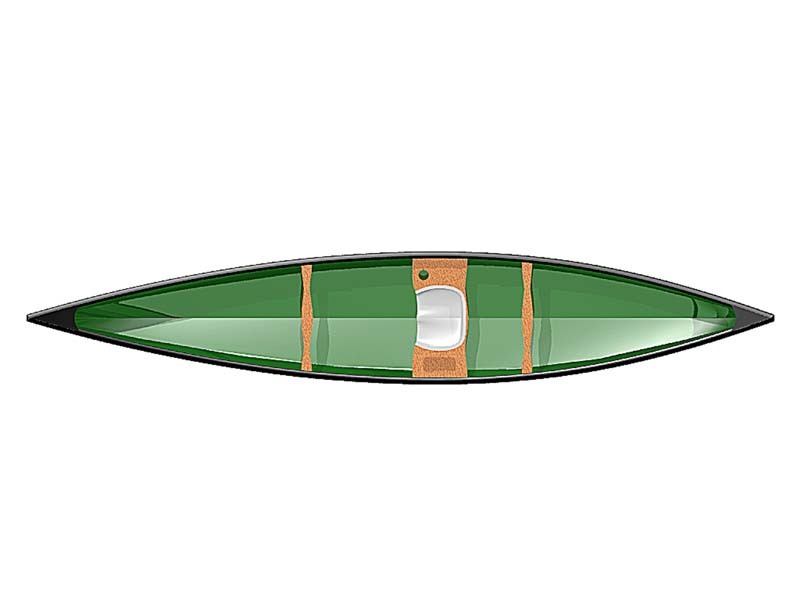 The aka tubes are aircraft aluminum and will be segmented with the same spring pins and fitted ferrules you see on take-a-part paddles, so that the amas will reconnect right up next to the main hull for transport and storage. A very compact unit for putting on the roof of your car and going off to the beach, or lake, for some fun. The build is 3mm marine ply with a full layer of glass outside and taped joints inside. Easy to build, easy to move around the launch site and perfect for learning to sail with little kids as they can sit between your legs and learn how things work. Later, the same kids can take the boat out on their own and there will be no fear of them tipping over unless a tornado hits the area. There is a companion model at 14′ LOA for slightly larger sailors, all within the car-topping attitude that this boat represents. The SOLO 14 has an optional ama design that allows the removal of the leeboard as the lateral resistance will come from the underwater fin shapes of the amas. This keeps the stuff hanging in the water to a minimum while still allowing a decent performance capability. fewer moving parts will mean simpler maintenance and less stuff to possibly break while out sailing. The rendering above shows the finned amas in place. I grew up just a couple of miles from the Palos Verdes Peninsula along the coast of Los Angeles County and would often snorkel in those waters for abalone and lobsters with a group of my friends. One of the first “boats” I ever worked on, a leaky, 12′ paddleboard rescued from the heap out behind the main Lifeguard station in Redondo Beach, was used to explore the area with my buddies. Later, we cobbled together a catamaran of our own making by screwing together two of the paddleboards down on the beach and paddling both of them out to our favorite dive and play area.Guarding the northernmost entrance to Lunada Bay is Rocky Point. 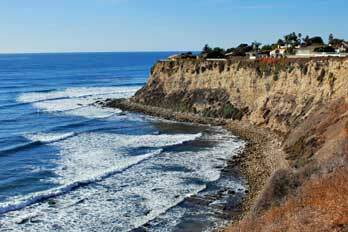 The waters around Rocky Point, which is the northern limit of the famous big wave riding area known as Lunada Bay, can be anything from totally benign and calm, to a full tilt, out of control melee of oceanic surges and thundering waves. When I started to design boats, I instinctively drew upon locations from my boyhood watery exploits and the name for this sea kayak, Rocky Point, came from this familiarity. The Rocky Point is designed as a very fast, no-nonsense expedition touring boat with the capacity to carry the necessary gear and stores for an extended stay away from civilization. Obviously, with its narrow beam, this is not a beginner’s boat. Experienced paddlers, though, will settle-in quickly to its gently lessened stability and be able to make the most of the very small frontal area and very long waterline. The prismatic coefficient of the hull is set to .55 which will allow the paddler to reach and hold a very fast cruising speed. The boat should be equipped with an expedition class rudder to provide a gentle assist in turning as the hull has reduced rocker from my other sea kayak designs and turning was considered a skill for the advanced paddler for whom the boat was created..
Just about all of my sea kayaks are designed with what I refer to as “a modified barrel back” stern. 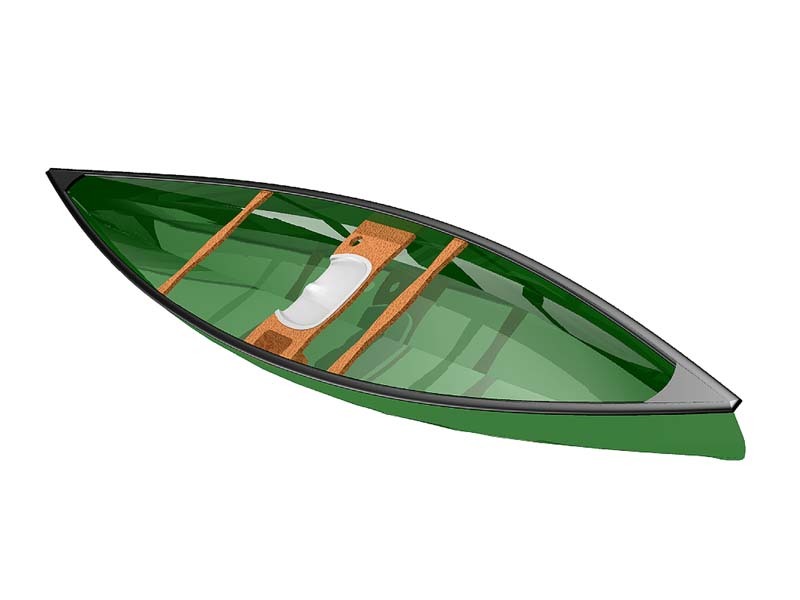 Not only do I wish to set my kayak designs apart from the everyday Greenland style craft, but I wanted to reduce the windage signature for the entire boat. My take on the Barrel Back form comes from the Art Deco inspired speedboats of the 20’s and 30’s, a very creative era in boating which continues to inspire me. The construction method is via stitch and glue technique from a 3mm marine plywood. The boat is glass/epoxy inside and out. The builder can choose to do a carbon or Kevlar layup inside with durable S-glass on the exterior for a rugged, easily repaired hull that is quite stiff and light. Standard layup in glass should yield a boat that is under 50 lbs. complete. Use of exotic laminate cloth will reduce the overall weight while making the boat a lot stiffer. This is not an all-out racing machine. Instead, it is a very fast sea kayak in the racing boat style with its lowered aft deck, minimal foredeck height, maximized waterline for length and a hull shaped for performance. It is intended for experienced paddlers who want to really stretch it out and can maintain a fast clip on the water while carrying enough gear for a weekend trip. The kind of paddler for whom this boat is intended might want to explore the potential the Rocky Point has in a long distance paddling race and I expect that the boat will give an excellent showing against other, race specific designs…. and if the paddler were at a truly thuggish fitness level, this boat just might be able to steal away a victory. I’d love to see that. Over the past couple of years, I have taken a break from my boat design work. During that time, I’ve been able to reassess my connection to the craft. The last boat I designed was the Europa 20, which is a trimaran meant for vertical strip foam construction with sandwich style, infused epoxy/glass laminates inside and out. The Europa is a boat for very fast day sailing with a very light hull and a very big rig. A boat that is not for everyone, to be sure, as it requires a level of skill that the average guy does not typically cultivate in the course of experiencing their recreational boating interests. Looking long and hard at the smaller skiff-like hull designs I had done before, such as the Montage, I decided to draw the new boat in that same general size, but with a very different approach when it comes to how the boat achieves its performance potential. Where the Montage has a relatively spacious cockpit capable of taking on a couple of adults, (or a parent and a couple of smaller kids) the new, Corsica 15R trimaran would be for one adult (or accomplished kid) designed solely for a unique, one-up sailing experience within the small beach multihull genre. Much like a performance dinghy, the Montage has a wide, flat sailing surface conducive to the planing of the main hull. It’s more like an outrigger supported dinghy in that regard, than it is a trimaran. Certainly, the Montage fits within a grey area when it comes to defining nomenclature. The Corsica 15R, however, would be very much like other high performance trimarans with very slender, easily driven hulls that have the potential to achieve boat speeds well beyond the typical displacement design. There is no main hull planing function going on with the Corsica 15R. It is all about pure, straightforward achievable speed via well-known multihull design thinking. As a result, the boat has minimized clutter when it comes to excessive high-tech trickery. With that approach, the Corsica 15R is also going to be a boat that has much lower maintenance requirements in order to keep it in top sailing condition, as well as a much lower realized cost to get it on the water and ready to sail. If you are into cars, as I am, then think in terms of a nicely pumped, Mazda Miata, type of boat that would be a cool, weekend canyon racer for one person. A boat that could blast around the local waters in a good breeze and give chase to other small, fast, multihulls being sailed by crews of two. The result of this conceptualizing process is the Corsica 15R. The C15R is a boat of modest, marine plywood build techniques and is very light weight for its generous sail area. With this boat, the normal sailing position would be the skipper, semi-reclined within the main hull, driving his machine like an F1 Grand Prix car. In this configuration, the boat is designed to utilize foot pedals for steering, leaving the hands free to work the sheets. But, that’s not the only way to sail this boat. Owners who wish to sail in a more conventional multihull style, can sit-up out of the cockpit and onto the main hull cockpit gunnel, or even the trampoline surfaces all the way out to the ama, where they will steer with a tiller extension. A construction style in multichine, 4 mm marine plywood, allows the boat to be assembled in a well-understood fashion that will go together quickly. With a subtle placement of minimal stringers and sufficient bulkheads, the C15R becomes a strong main hull shell that can absorb the loads from its sizeable rig, turning the power of the sails into forward thrust in the water. There is no fully enclosed transom on the vaka hull. The cockpit deck is slanted gently down and aft for automatic self-draining, such as is seen in sport dinghies and larger race boats. A collection of bulkheads under the cockpit deck provide structural support and watertight compartments ensuring that the boat will not likely sink even if large sections of the bottom are torn out from an underwater hazard while smoking along in a gin clear lagoon. 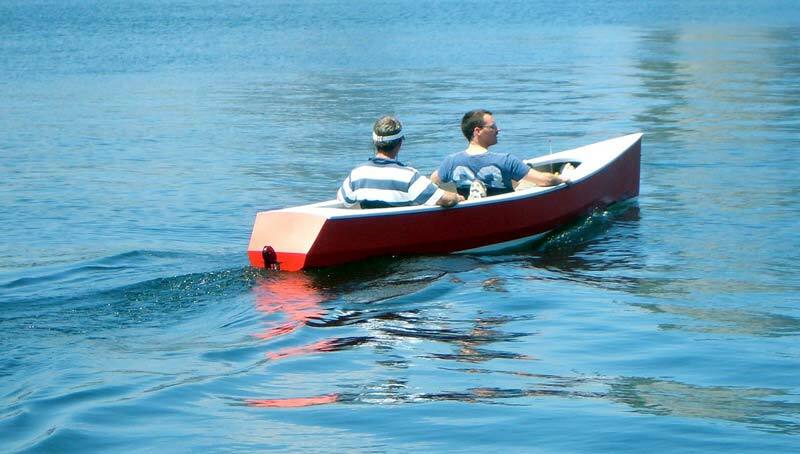 The demounted boat can be assembled easily by one person. The gently gull-winged akas are built with a glassed box beam core. The inboard ends of the akas slide into tapered sockets in the main hull and are levered in place with stainless waterstays to make ready for sailing. This, tapered socket technique prevents binding while assembling the boat, while providing a solid, hassle-free and weight minimized demounting system. The leading edges of the akas are smoothly shaped foam blocks that are glassed onto the box beam to provide an aero component, as well as creating reduced drag from waves and spray. The akas are hard fastened to the amas as a complete assembly that is easily removable from the vaka hull. The trampolines stay mounted to the akas and amas for transport and only have to be hooked and tensioned to the main hull during assembly. A removable carbon prodder sets the tone at the front end of the boat. The stick originates as a carbon windsurf mast, so it is easily found on the used market and equally replaceable, should it get poked into an unyielding environment. For trailering, the sprit unpins, slides out of its socket and is stowed in the cockpit for transport and storage. http://home.comcast.net/~ritakend/site/?/page/Mast_Raising/&PHPSESSID=864f3404e3f46ed29dd99b863018fc1d This is a very simple way to raise a mast should you need to avoid the trad lifting exercise for one reason or another. I chose to not go with tricked-out, curved lifting foils in the amas due to construction complexity and added cost for the builder. Foils of this type are hard to build correctly by hand, as are the needed curved trunks in which they slide. Instead, the boat is equipped with a daggerboard that is inserted through the deck of the main hull in front of the mast which angles aft to exit the hull below the waterline. A daggerboard and trunk of this type are much simpler forms to build and orient in the hull. It is also just one main foil, where lifting foils need to be made in pairs, one for each ama. Lifting foils also need complex control mechanisms to retract and deploy the foils and they have to work from the cockpit remotely with the foils mounted way out in the amas. The needed controls are an interesting problem when the boat is 13’ in width and the driver is semi-reclined in the main hull. Note: I’m not against an owner who might want to experiment with foiling for this boat, even if it is just foil assist and not full flying. 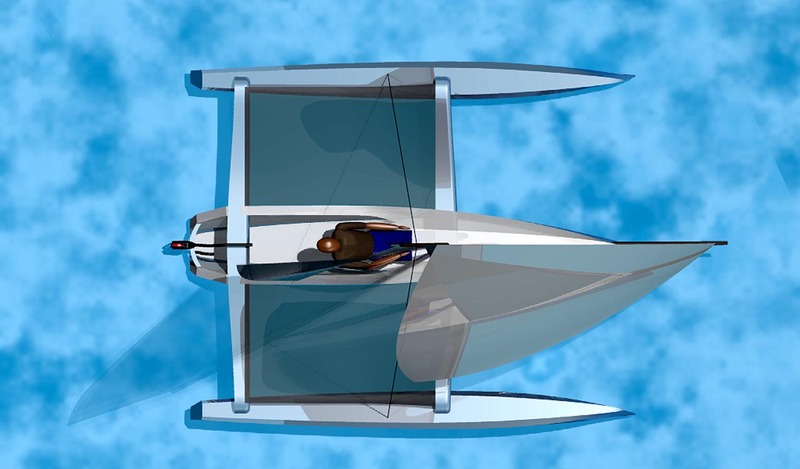 It would require a lifting t-foil style rudder and twin Bruce style foils in the amas, or, if a person is really accomplished as a composites builder, they could make a pair of matching c-foils for the ama. The owner just needs to know what level of additional work is involved and at what skill level they need to perform in order to get the desired result. If you are on a budget, the rudder and headstock from a Hobie 16 will work just fine for the Corsica with some mods to the tiller. The more deluxe, Rudder 25 system from Dotan will also work well, should you have the coin. http://www.dotan.com/ If you plan on pushing the boat hard, then a longer blade will be required, or you can get yourself invested in the process of putting a rudder on each ama and have stunning control at your finger tips. On the down side, that change will cost you a bit out of your pocket and at the launch ramp in setup time… though I can see a nifty rig with light alu tubing and the use of snap buttons as a cool solution. The Corsica 15R will be a light boat built from familiar materials. It should be a fairly simple building experience for the owner and will fit comfortably into any typical garage space, making it easy to find a building location. It will quickly assemble for sailing and be hassle free with minimal maintenance required to keep it in top form. It can be towed behind any compact car on a typical beach cat trailer and when demounted for travel, is road legal anywhere in the world. On the water, this boat should be quite quick and behave with predictable, pin-point sailing manners. With the skipper slung comfortably in his reclined cockpit seat, he will be decently protected from the effects of the weather and sea state while tearing around his local waters. Some time back, I encountered an ex-pat American, now living in Melbourne, Australia, by the name of Mack Horton. 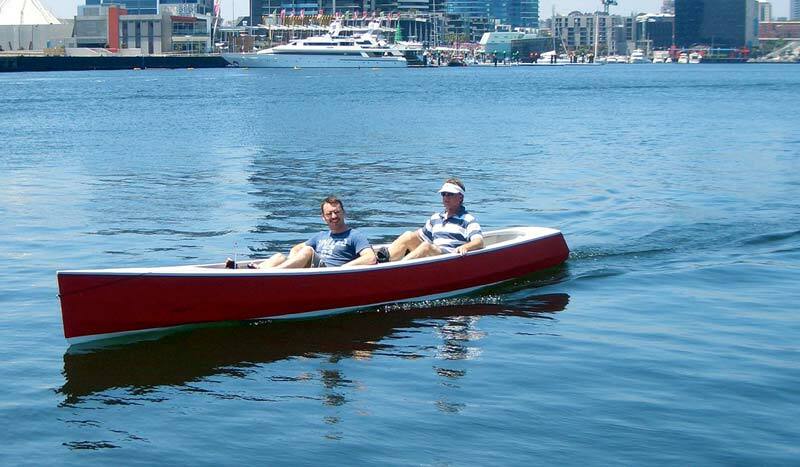 Mack wanted to build a two-person boat for cruising the harbor and waterways of his hometown, Melbourne. He was looking to propel his boat with a twin setup of the wonderfully innovative Hobie Mirage drive designed by Greg Ketterman. I really liked that idea as I had already done a few different boats that were Mirage capable, but they were all solo boats. This design concept opened a new door for me, as it would allow me work out the balance and weight issues for a twin drive and once built, I could also discover how much more speed potential might be available beyond a solo drive. I had a hull in mind from my portfolio that would need to be “massaged” just a bit to get the form stability and low-speed performance for which I was looking. The boat had to be able to handle potentially large boat wakes and small chop of the open regions of the harbor and still be easily driven by human leg power. I was looking to achieve some of the lines of a classic launch with reasonably low windage and yet, enough freeboard to ward off the possible conditions. Surprisingly, the hull form came directly from a previous boat shown at the Duckworks Magazine, the A18, canoe/trimaran. The A18 hull had a very strong bias towards higher speed potential with only a nod to being driven at slower speeds, so a slimming process had to take place in the forward and aft sections of the hull. Likewise, the beam of the hull was pulled out some to give the boat a solid degree of form stability so it could ride the wakes of passing freighters in the harbor when taken abeam. Mack has now finished the boat and has had it out on many outings. He’s learning a lot about boat trim and optimal placement of the heavier pedaler for best performance and handling. Besides the still photos showing the boat on the water, Mack has also provided a pair of video clips showing the boat underway. Clearly, Mack’s Strider, Ripple, is showing itself to be a pretty fast boat when being propelled by two average people. 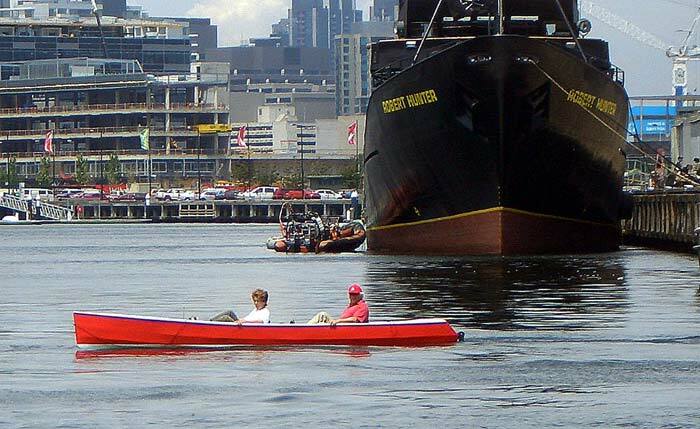 This is being done from a semi-reclining position with hands free, while enjoying the sights in the Melbourne harbor and adjacent waterways. Here is a link to an article I wrote for Duckworks Magazine that shows the GPS track and speed data achieved by the Strider design: http://duckworksmagazine.com/08/reports/feb-mar/index.htm This is pretty heady stuff for a human-powered vessel intended for casual cruising and not blistering speed. Later, as shown in the video clip, Mack and Justine took-on a fully crewed Dragon boat. Dragon boats measure 40 feet in length, 4 feet in width and carry 20 paddlers, 1 drummer, and 1 steers person. On average, these boats weigh 500 pounds. Understandably, Ripple could not quite match the speed of the Dragon boat with twice the waterline length and 20 paddlers. Perhaps there could be a triple version of the Strider in the future? One that is longer, more slender and much, much faster. The Strider design calls for a very straight forward stitch and glue build method in 4mm marine plywood with glass/epoxy laminates inside and out. The twin Mirage trunks sit cleanly in the hull allowing for a comfortable seating arrangement for two persons and their day pedaling “stuff” such as binoculars, cameras, food, drink, blankets, etc. In the right environment, the boat could easily be used for overnight camping as well, as there is plenty of displacement capacity for more gear, should the owners wish to use their boat in that fashion. I expect to see these boats being equipped with Bimini covers and small forward dodgers. The interior hull sides will probably be lined with neat rows of mesh bags to storage of the small things that make for a really nice time on the water, such as: sunscreen, lip balm, mosquito repellant, drinking water, snacks, camera, VHF radio, GPS, etc. The boat is cartoppable, much like a large canoe would be, but I’d advise the person doing the loading be reasonably fit and/or have a really sweet loading system, or technique, as the boat does weigh right around 70 pounds without the Mirage drives in place. 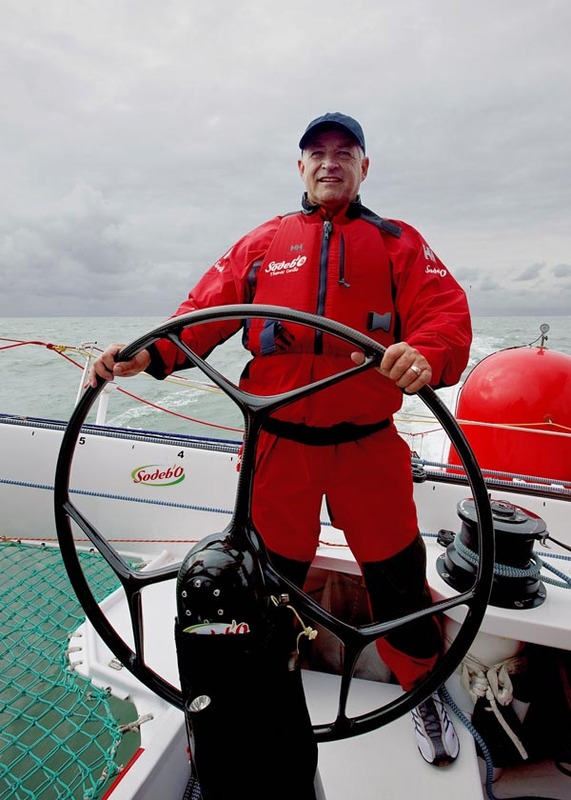 Mack has kindly supplied some very interesting speed marks for the boat that were confirmed with a Garmin Edge 305 GPS with wireless heart rate and cadence monitors. These figures run pretty much spot on with my estimations. They also indicate that the hull has gotten to its, “not gonna go there” speed limit and will be pushing uphill on its bow wave from that point on. Response has been very positive from athletes, because it’s fast… and from non-water type folks because Strider is stable, comfortable, dry and “not scary”. One of the reasons that Strider is so stable is due to the recreationally respectful beam of the hull. I’m working on a much faster version of the Strider design concept, which should pretty much take the Mirage drive out to its theoretical top speed limit. All in all, Strider is a really fun and stable human powered vessel designed for recreational pursuits by two people. It has the classic look and feel of a traditional launch to it while underway and can easily power-up to get out of the way of oncoming traffic in a crowded harbor, or lake setting.